The Ugg Adirondack II boot, other than some styling changes, is nearly identical to the original Ugg Adirondack my mom has worn for several years. Unlike most Uggs designed for women, the Adirondack provides superb traction, is plenty warm enough for cold weather, is easier to clean than most other Uggs and even has a de-factor snow gaiter built into the boot. And as an added bonus, the boot is relatively easy to get in and out of, too. The Ugg Adirondack II. View more info & prices at Amazon. There are many benefits to the Adirondack II boot. But in my opinion, the biggest benefit is the superb traction the boot provides. The lower boot consists of a Vibram outsole. For those not familiar with Vibram outsoles, they are used on virtually all hiking boots, water sandals and many brands of winter boots. Vibram outsoles provide superb traction in snowy, wet and generally slick conditions. There is a stark difference between the outsole used on most other Ugg boots (in this case, the Ugg Classic Short) and the Adirondack outsole. Compared to the standard Ugg outsole, the large and aggressive tread pattern of the Adirondack allows easy and safe walking in a wide variety of conditions. Moreover, the lower outsole is basically a specialized rubber, making the boot very easy to clean. The upper on the Adirondack II consists of leather and suede that has been seam sealed and is 100% waterproof. Since the upper is leather, the "issues" found with other Uggs—mainly getting heavily soiled and lack of waterproofing—is absent on the Adirondack. Granted, the Adirondack isn’t the "in" or most "fashionable" of Ugg boots. The boot won’t soon be challenging the Classic Short as the must wear boot on campus or in the office. Instead, the Adirondack prizes "function" over "form." While the Adirondack looks great, ultimately the Adirondack is meant for women who either spend considerable time outdoors in cold weather and need a warm boot or those who seek a boot with shearling insulation that provides the traction needed to safely walk in snowy, wet and slick conditions. If you plan on wearing the Ugg Adirondack in very cold weather for an extended period of time, don’t ruin the superb insulating properties of merino wool by wearing the wrong sock. To keep your feet warm, be sure to either go barefoot or wear a sock made from merino wool while wearing Ugg boots, such as those sock made by SmartWool. More information about SmartWool socks. Overall, the Ugg Adirondack II is a superb boot. Well constructed and containing premium merino wool, the Adirondack is the best "all-around winter boot" for women that Ugg makes. If you seek the benefits of shearling insulation in a boot but yet need a boot that is highly functional in a wide variety of winter weather conditions, then the Ugg Adirondack is tough to beat. The Adirondack is available online at the major shoe retailers. Offline, a few larger departments stores, such as Nordstrom's, also carry the Adirondack. The Adirondack boot is almost always available in all sizes and colors at Amazon. 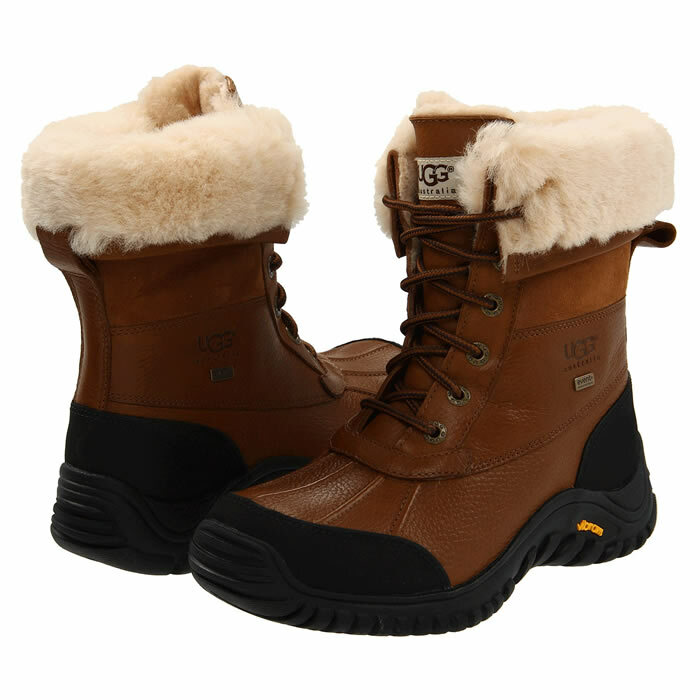 The Ugg Adirondack is generally priced around $240, although Amazon usually sells them for less. Other online retailers where the Adirondack is often available include Zappos, Shoes.Com and Shoebuy. Temperature Rating : Not rated. But should do well down to 0 degrees, provided the proper winter sock is worn. Colors Available : Changes yearly. Weight : 1 lb 7oz. Snow Cuff : Partially. Sheep skin lining around ankle acts as a de factor snow gaiter. Upper : Leather with Suede that is waterproof..
Sizes Available : 5 to 10, whole and half sizes. Vibram Sole is identical to what is used on quality hiking boots. Provides superb traction on wet and slippery surfaces. Designed for cold weather. Just remember to use the right winter sock. Height of the boot and the sheep skin at top of boots shaft provides a de-factor snow gaiter. Vibram outsole makes the lower part of the boot exceptionally easy to clean. Just wash down. The leather upper is also quite easy to clean and won't cake up with mud.